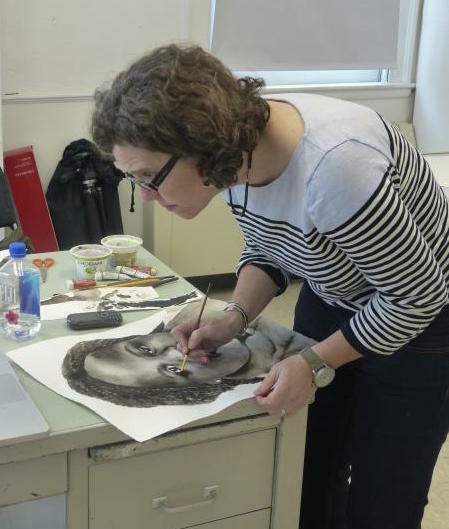 The University has had a successful Artist-in-Residence (AIR) program since 1986. The program was originally designed for the artists to create a work of art that would be displayed on campus. In 2015, the mission was changed for the artist to create a temporary project in the greater community. During their 7-week residency, AIRs also give a public presentation, engage with the USM community, visit art classes, and work with interns. The residency projects since 2015 are listed below. The previous AIR collection can be viewed here. 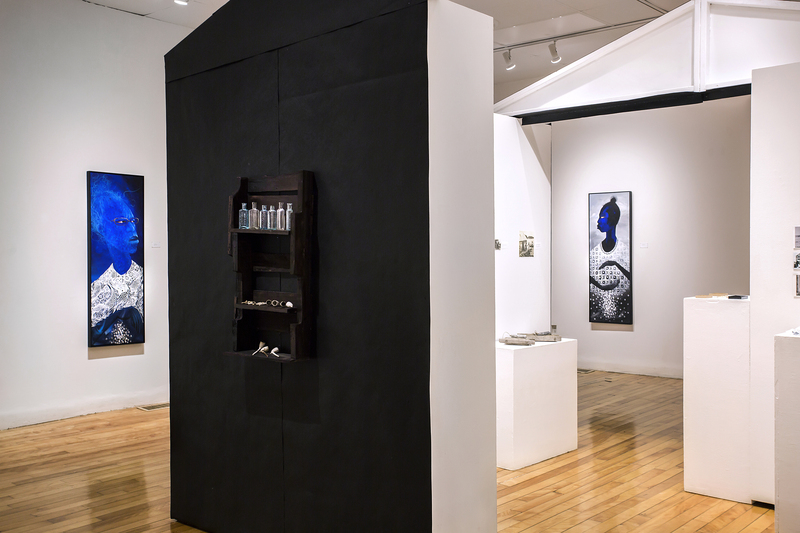 The OTHERED exhibition is part of Daniel Minter’s USM artist residency during the fall of 2018. We thank The Warren Memorial Foundation for their sponsorship of this residency and resulting catalog. Malaga Island is a small island on the coast of Maine that in 1912 the State purchased, ordered the mixed-race fishing community to leave, removed the buildings and exhumed the cemetery. USM Artist-in-Residence Daniel Minter, known for his visual storytelling, recalls this complex story with paintings, assemblage, and a small house in the gallery filled with historical photographs and archeological artifacts relaying a sense of place, loss, emptiness, and wholeness. Minter states: I imagine that the people of Malaga Island were able to maintain the sense of an inner home even at a time when every outward representation of home was being taken away. The image of the person standing in the water; the turbulent calm of the body and visage are reminders that in the face of eradication we may disappear but our spirits are not diminished. Our physical home is shallow whereas the depth of our inner home cannot be measured. 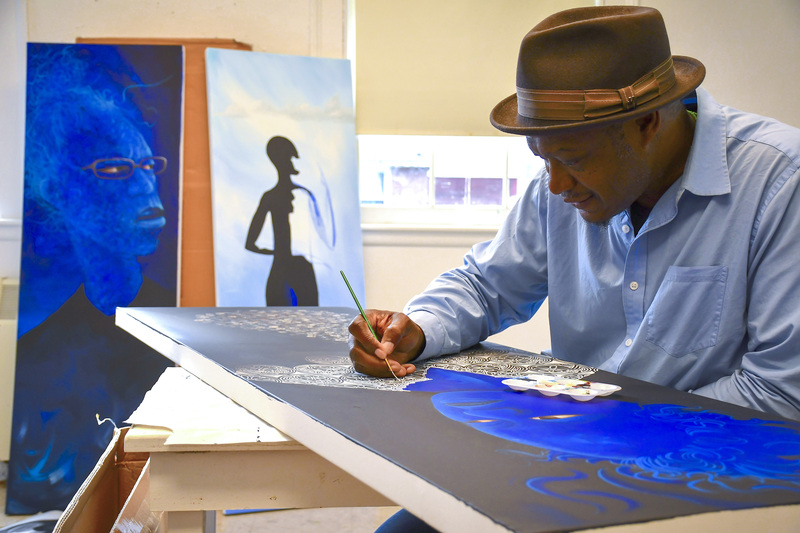 Minter's artwork reflects abiding themes of displacement and diaspora; ordinary/extraordinary blackness; spirituality in the Afro-Atlantic world; and the (re)creation of meanings of home. Minter’s paintings, carvings, blockprints and sculptures have been exhibited both nationally and internationally at galleries and museums including the Portland Museum of Art, Seattle Art Museum, Tacoma Art Museum, Bates College, Hammonds House Museum, Northwest African American Art Museum, Museum Jorge Amado and the Meridian International Center. Right: Minter in the AIR studio on the Gorham campus. Simons cut her teeth on art activism as a member of the Maine- based Beehive Design Collective. For over a decade, she traveled around the U.S. presenting the Beehive’s graphic works to communities in struggle and using arts-based education in social movement contexts. Now based in Pittsburgh, Simons works as a cultural organizer, illustrator, and graphic designer. Simons was Artist-in-Residence February 16- March 29, 2018. Her residency project of creating graphic tools for the Southern Maine Workers' Center campaign for healthcare was supported by the Warren Memorial Foundation Visiting Artist Lecture Series. As part of Emily Simons' residency, she worked with a crew of collaborators to produce the End the Debt! Decolonize! Liberate! Scroll, a 175 long 3 inch high participatory illustration that tells a story of the colonization and resistance of the people of Puerto Rico. The piece can only be seen by standing in a circle and passing it together, allowing the audience to experience and hold together this complicated, ongoing story of resistance in the face of many interconnected oppressions. 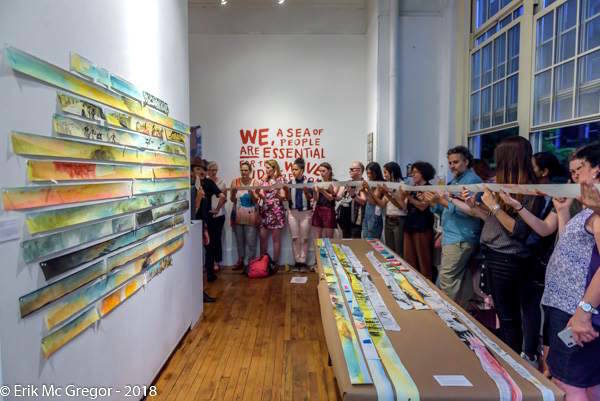 The piece premiered in New York City at the Clemente Soto Vélez center on the lower east side of New York City, where collaborator Dey Hernandez also re-staged the scroll-production scene from the studio at USM. The scroll is continuing to travel to communities across the US and Puerto Rico with AgitArte Cultural Workers, where communities learn and connect to Puerto Rican resistance through this unique piece of art. The project was organized by the USM Artist-in-Residence program in collaboration with the School of Social Work and Coffee By Design. Carolyn Eyler, USM Director of Exhibitions and Programs, executed site research and project management. Muhsana Ali and Dr. Paula Gerstenblatt taught a class that created an opportunity for USM students of many disciplines and community members to work together. Over one hundred USM students and several hundred community members participated in making small glass paintings. The artist and her assistants incorporated these pieces along with cut mirror, tiles, and ceramic pieces that were adhered to the wall with a mixture of pigmented concrete and sand. Special mention is given to Senegalese artist, Amadou Kane Sy, Ali’s husband and colleague, who assisted in the creation of the mural. Many thanks to USM art alumna Mia Bogyo, USM art intern Kayla Frost, and USM art student Kenneth S. Davis. This project was completed with generous contributions by Redfern Properties, Coffee By Design, the USM Office of the President, the Running with Scissors artist community, an anonymous local donor, and all those who contributed material donations. Welcome to New Mainers is now on display inside the Portland Jetport. 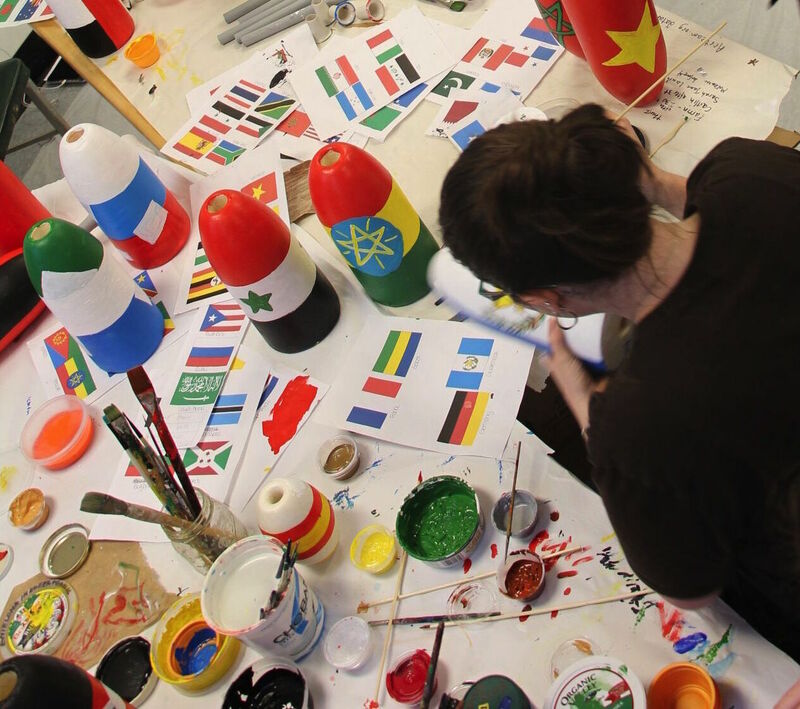 Mayers engaged over a hundred USM and area students to paint these buoys with the flags of the 77 countries represented by Portland’s newest residents. The idea began with a banner for the Maine Immigrants’ Rights Coalition painted by Mayers in collaboration with members of the Union of Maine Visual Artists (UMVA) and The Artists’ Rapid Response Team (ARRT! ), an activist group Mayers founded in 2012. The first buoys were painted by students in the Portland Public Schools’ Multilingual & Multicultural Center’s “Make it Happen!” program for the opening of the exhibition “400 Years of New Mainers” at the Maine Historical Society. USM students from many disciplines completed that first set, which now hangs in the skywalk. 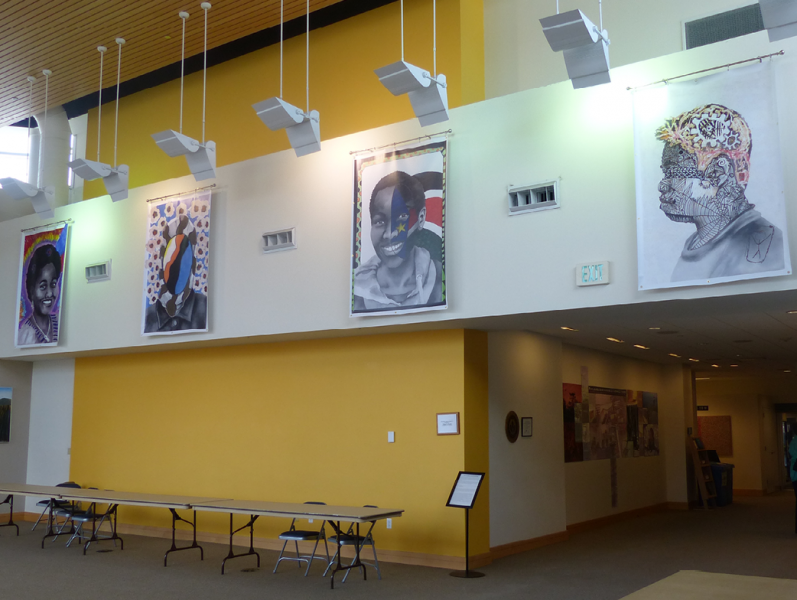 USM art students made a second set to hang in the Portland Jetport. 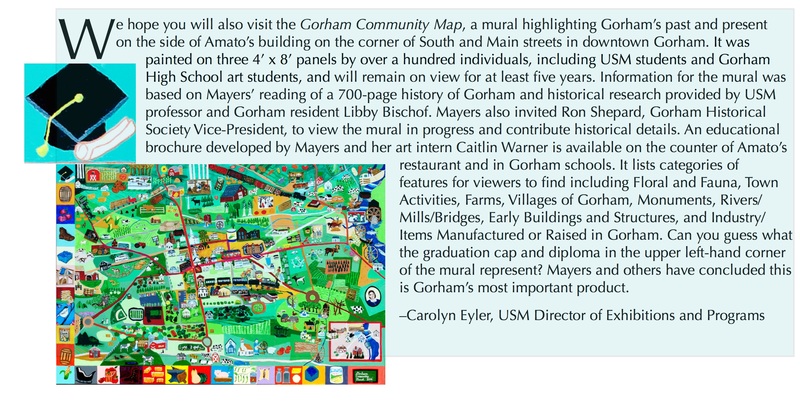 During her 7-week residency with the USM Art Department in Spring 2016, well-known Maine community artist Natasha Mayers facilitated two significant public art projects: Welcome to New Mainers (Flags on Lobster Buoys) and the Gorham Community Map mural. “I hope the buoy installations will make us all more aware of the rich cultural diversity being woven into Maine and help us open our hearts to the contributions and struggles of our new neighbors,” Mayers said. The students’ collective effort transformed a traditional icon of Maine and the sea, which many immigrants have traversed, and imbued it with new associations. Viewers themselves are travelers at the sites of these installations, and they pass through a syncopated rhythm of brightly colored patterns and varying shapes at alternating heights. This celebratory experience initiated by Mayers, Maine’s leading activist artist, is a great gift to, from, and about the state of Maine. USM art lecturer Lin Lisberger and Jess Lauren Lipton of Creative Portland helped arrange the Jetport installation. USM art students Caitlin Warner, Farrin Hanson, Sara Jane Laughlin, Mackenzie Moore, and Kennedy Sheafe participated in the installations. For the past 17 years, Molloy has worked on collaborative art projects in New York City and across the U.S., exploring themes of adolescent identity, and building and strengthening communities. The Center's Multicultural Program is divided into two groups of middle school and high school students, and Molloy created a separate artwork with each group.